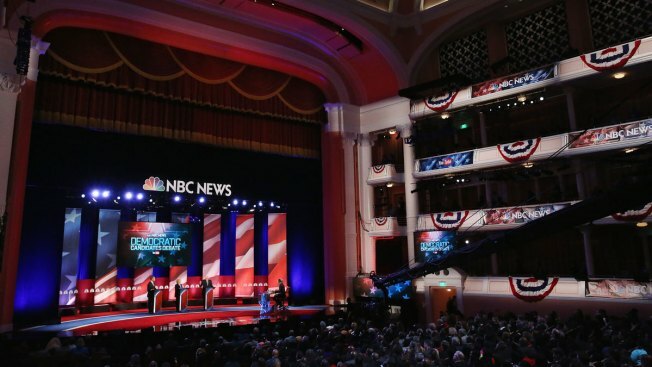 This Jan. 17, 2016, file photo shows a Democratic presidential debate hosted by NBC News and YouTube in Charleston, South Carolina, the final debate for the Democratic candidates before the Iowa caucuses. Democratic presidential candidates will debate 12 times ahead of the 2020 primaries, starting this June and July, NBC News reported. The debates will be split into separate events on back-to-back nights, six in 2019 and six in 2020, Democratic National Committee Chairman Tom Perez told reporters. Perez expects a large field of contenders and said drawing lots would be the fairest way to divide them between events. Some Republicans in the large 2016 primary field were left in an undercard event. Criteria for entering the Democratic debates will include polling and grassroots fundraising, Perez said. Candidates will be discouraged from appearing in debates outside the 12 sanctioned by the DNC.